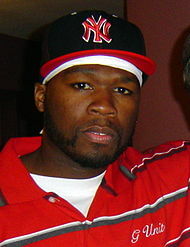 50 Cent's "In da Club" took the top spot, one of four singles from his debut studio album Get Rich or Die Tryin' to make the list (at positions 1, 14, 21, and 63). He was also featured on Lil' Kim's Magic Stick, ranked 20. This is a list of Billboard magazine's Top Hot 100 songs of 2003. ^ "2003 The Year in Music: Hot 100 Singles & Tracks". Billboard. December 27, 2003. pp. YE-30, YE-32. Retrieved February 11, 2017. This page was last edited on 7 April 2019, at 02:39 (UTC).